Do you prefer to relax or be active? 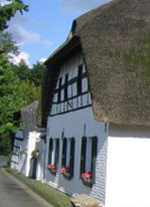 Thatched cottages, working watermills, green fields and mellow valleys. Even Napoleon and his men chose the picturesque headwaters of the river Schwalm for rest on their conquest through Europe. 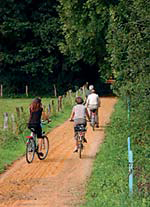 Discover the diverse landscape of the German-Dutch Natural Park Maas-Schwalm-Nette unique nature preserves and the tranquil charm of its small historical locations like Wegberg www.wegberg.de and Schwaam. During your excursions through the Photo : A Horse near Thomeshofsilent nature you can leave your hectic every day life behind. 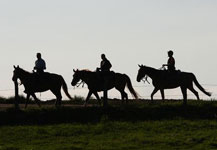 In close vicinity you will find stabling for your own horse as well as a tempting offer of going hacking by well trained horses. You can enjoy the picturesque surroundings in a horse drawn wagon or cart just like the good old days. There are 2 sophisticated 18-hole golf courses in the near vicinity, called the Golf club Wildenrath and Golf club Schmitzhof. 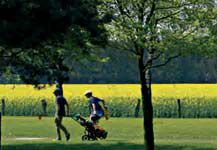 Surrounded by enchanting countryside you will find unlimited golfing pleasure throughout the whole year. Do you wish for more information? We will be only too happy to send you comprehensive brochures. Call us or use our Enquiry page!